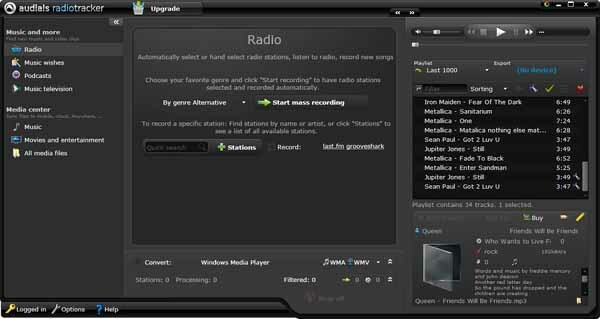 Free download Audials Radiotracker Latest Version.The Audials Radiotracker database contains an impressive 10,000,000 tracks. Simply select an artist, album or individual track and Radiotracker goes to work, using the Audials Network to find the right radio station and automatically record your desired tracks, before saving these new files as private copies on your PC. As an added bonus, Audials Radiotracker delivers tons of podcasts and top music TV programs from the Internet. Furthermore, there are loads of extras to make managing your collection on your PC or your cloud easy. Even loading up your shiny new smartphone with brand new media is child’s play with Radiotracker. Audials Radiotracker is the tried and tested tool among Internet radio software that takes care of all your radio entertainment needs. But for more, you just need One. Audials One has all the same features and functionality as Audials Radiotracker, while also offering a lighting fast turbo function to fulfill your music wishes mega fast and additional unbeatable possibilities for your entertainment. No other piece of software offers as many possibilities for maximizing Internet-radio entertainment. Using Audials Radiotracker is easy and it takes just a few seconds to find international, regional and local stations that frequently play your favorite artist. Audials Radiotracker even shows you who’s playing on a given station before tuning in.